White Thermofoil cabinet doors feature a flawless, silky-smooth surface. Thermofoil material is applied to medium-density fiberboard (MDF) using an intense heat and pressure-bonding process to ensure durability. Thermofoil finish is made of laminate and provides a uniform look from door to door. Thermofoil reacts to heat, especially excessive heat generated by an oven. 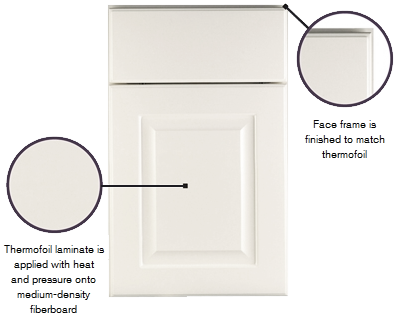 To protect your thermofoil finish, a KraftMaid heat shield is required on cabinetry located next to an oven. Prolonged exposure to tobacco smoke will discolor thermofoil finishes. This side effect is not covered under warranty.